It’s time for A to Wa of Japan again! Last week’s post was about things beginning with あ (a) and we looked at Amuro Namie (安室奈美恵), Arashiyama (嵐山) and Anko (あんこ). This week we are looking at things beginning with い (i), and I’d like to thank everyone who joined in with suggestions. lovelycomplex22 suggested 石井裕也 (Ishii Yuya) – a film director; Jay Dee suggested いちご (ichigo – strawberry), 犬山 (Inuyama in Aichi), 西表山猫 (Iriomote-yamaneko – the Iriomoto mountain cat); UK Seikatsu suggested 井上陽水 (Inoue Yosui – a singer/song writer), 石原裕次郎 (Ishihara Yujiro – an actor and singer), 井上雄彦 (Inoue Takehiko – a manga artist), 石ノ森 章太郎 (Ishinomori Shotaro – a manga artist), 伊丹十三 (Itami Juzo – a film director and actor), イエロー・マジック・オーケストラ (Yellow Magic Orchestra – a band), インスタントラーメン (instant ramen), いなり寿司 (Inarizushi – a kind of food), 出雲大社 (Izumo-taisha – a Shinto shrine), 伊万里焼 (Imari-yaki – porcelain from the Arita region of Saga Prefecture) and イカめし (ikameshi – a dish from Hokkaido); and Francoise suggested 稲荷 (Inari – a Shinto god) and 今村 昌平 (Imamura Shohei – a film director). I’ve never been to Shimane Prefecture (島根県), so I thought it would be interesting to write about this shrine which I haven’t had the chance to visit yet. Shimane Prefecture is located in the Chugoku region on Honshu, the main island of Japan, as you can see in the map below. The marker on the map shows the location of Izumo-taisha. Named after Izumo Taisha’s honden (sanctuary), like Ise Grand Shrine’s shinmei-zukuri style it features a bark roof decorated with poles called chigi and katsuogi, plus archaic features like gable-end pillars and a single central pillar (shin no mihashira). The honden’s floor is raised above the ground through the use of stilts. Like the shinmei-zukuri and sumiyoshi-zukuri styles, it predates the arrival in Japan of Buddhism. Shinto shrines are dedicated to particular gods, and Izumo-taisha is dedicated to Okuninushi no Mikoto, the nephew of the Sun Goddess, who is famous as the Shinto god of marriage. When visitors to this shrine pray, they clap their hands four times instead of the usual twice – twice for themselves and twice for their partner or desired partner. 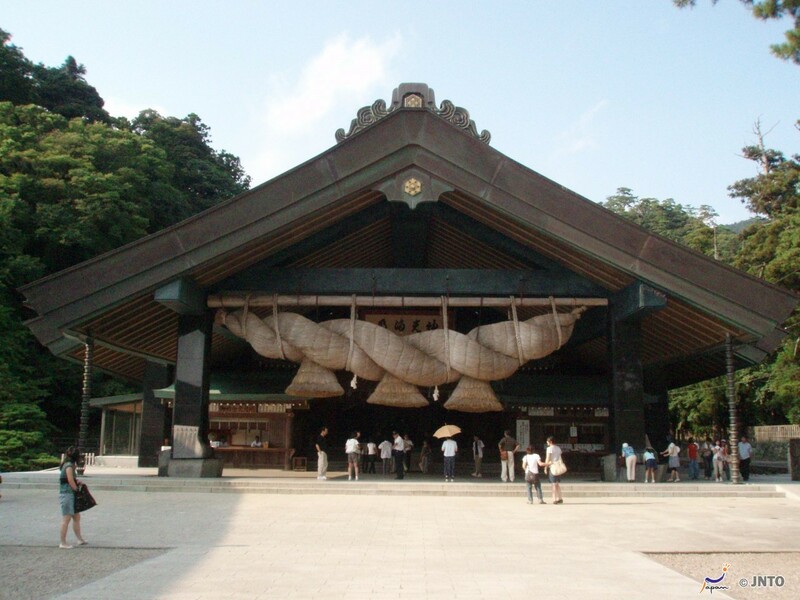 In 1952, the main hall and attached buildings of Izumo-taisha were designated National Treasures of Japan (国宝). Several other buildings in the shrine compound are on the list of Important Cultural Properties of Japan (重要文化財). It is not known exactly when Izumo-taisha was built, but there are references to the shrine in historical documents from as early as 950 (which was during the Heian Period / 平安時代), in which is was described as the highest building at approximately 48 metres (ref: Wikipedia). Now, however, the main structure is only 24 metres high. In the picture above you can see Izumo-taisha’s Kaguraden (Kagura hall / 神楽殿), which was first built in 1776 and rebuilt in 1981. 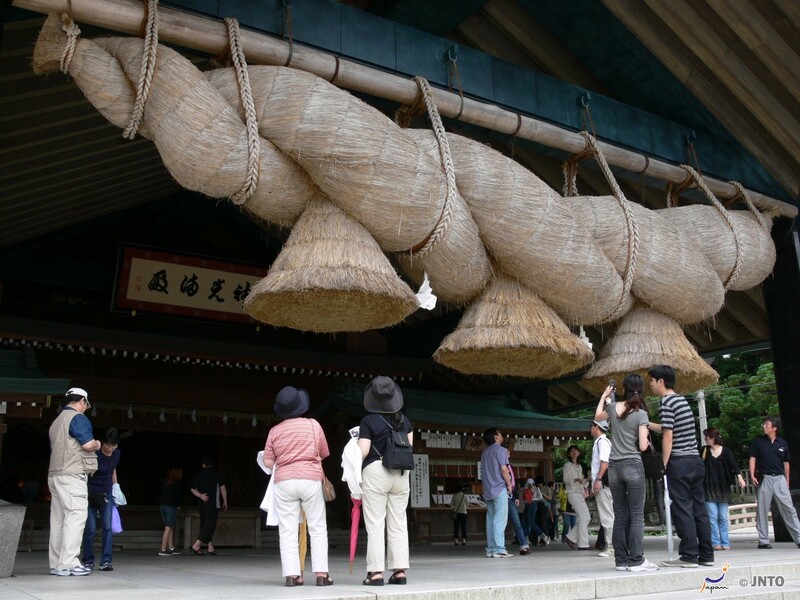 The most striking feature of this hall is the huge straw rope hanging at the front, which is called a shimenawa. This sacred straw rope is 13.5 metres long and weighs around 5 tons. Apparently there are lots of coins sticking out of the rope, and if you throw a coin in and it sticks your wish will come true. A number of festivals are held at Izumo-taisha, with the most important being the Imperial Festival held on 14th May. Directly after this is the Grand Festival, held on 14th and 15th May. The other important time in Izumo-taisha’s calendar is October, as this is when all the gods are said to gather at the shrine to discuss the coming year’s marriages, births and deaths. The people in Izumo call this month kamiarizuki (the ‘month with gods’ / 神有月), but the rest of Japan call this month kannazuki (the ‘month without gods’ / 神無月). Visiting Izumo-taisha is not difficult, although it is a little out of the way. The main station closest to the shrine is Izumoshi Station, and from there you can take a train to Izumo Taisha-mae Station or a bus which stops by the shrine. Both journeys cost around ￥500 one way, and take 20 – 30 minutes. 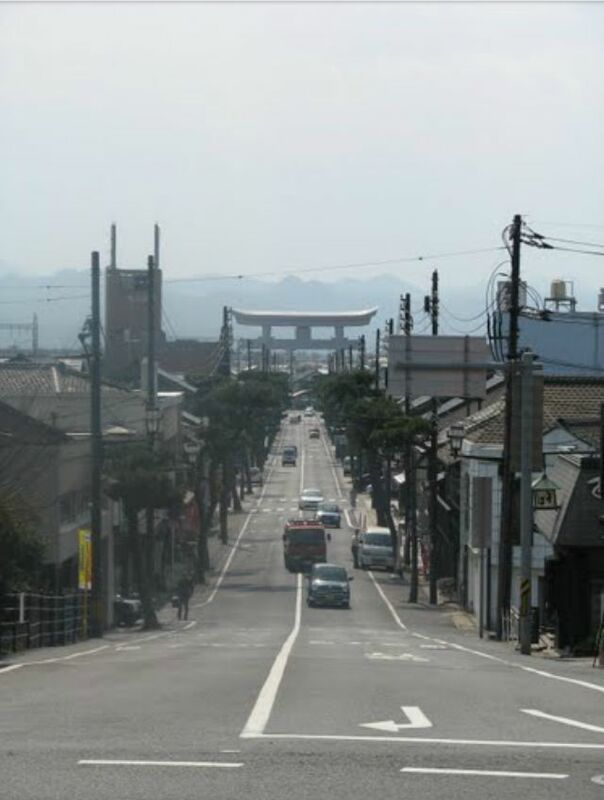 Izumoshi Station is about one hour west of Matsue City (松江市), which is the capital of Shimane Prefecture. Izumo-taisha looks like just the kind of place I would enjoy visiting, and I think I’ll have to add it to my ever-growing list now! Yum. That’s pretty much all I need to say about inarizushi, pictured above. 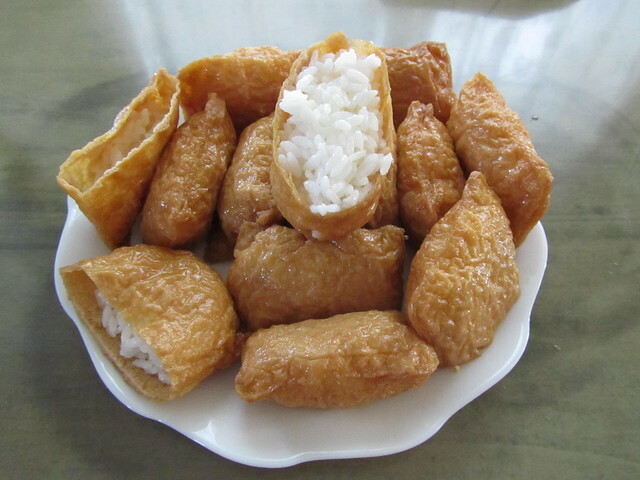 Inarizushi is a little fried tofu pocket filled with sticky rice, and sometimes other ingredients like green beans or carrots. The tofu is cooked in a sauce made from soy sauce, mirin (sweet rice wine) and sugar, which leaves the pockets with an oily feel (although they’re not actually oily at all), and makes the tofu taste really sweet and almost juicy. 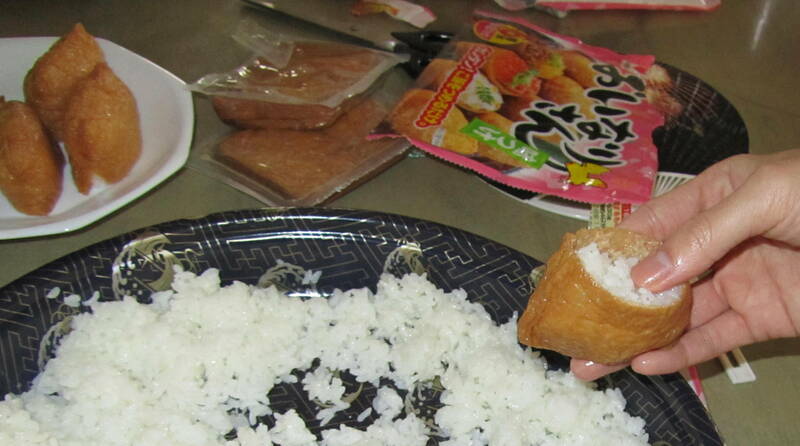 The name ‘inarizushi’ is interesting, and you might recognise the word ‘inari’ from other parts of Japanese culture. 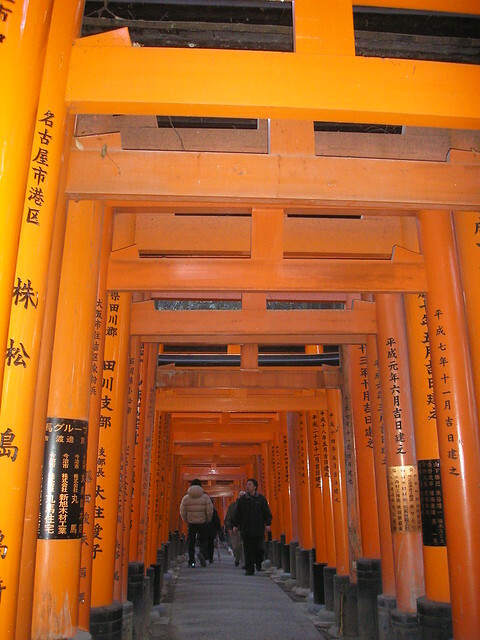 Actually, Inari ((稲荷) is the name of a Shinto god, and there are lots of shrines in Japan dedicated to this god, such as Fushimi Inari Taisha (伏見稲荷大社), and many smaller shrines too. Inari’s messengers are foxes, or kitsune (狐), and offerings are often left at these shrines for the messengers. 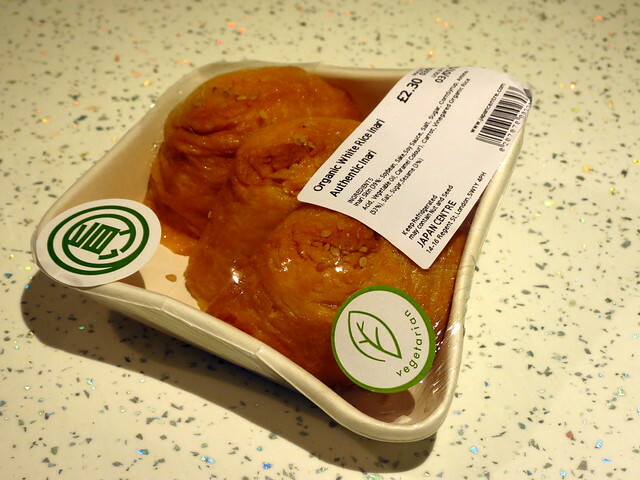 It is believed that fried tofu was a favourite of the foxes, and this could be how inarizushi got its name. Next week we’ll start with う (u), so please leave a comment below suggesting a topic for things beginning with う. Topics can be anything, as long as they are connected to Japan – food, places, people, characters, whatever you want to hear about! Just remember that the words you suggest must be Japanese (for example, you can’t suggest ‘umbrella’ for ‘u’, because ‘umbrella’ in Japanese is ‘kasa’, but you could suggest ‘umeboshi’, which is a pickled plum. Izumo Taisha is awesome! I went there a few years ago after visiting Matsue Castle! Shimane Prefecture is quite nice! You’re lucky to have been to Izumo-taisha! My suggestions: udon, undokai, ume, Urawa (now part of Saitama city), and Uwajima (Ehime). Fantastic ideas – thanks Jay Dee! Forgot to mention, Uwajima is home to a fertility shrine. mmm inarizushi is so good! How about Uzumaki Naruto from Naruto, unagi, and umeboshi (yum!)?? Thanks for the ideas! Haha – you and your Naruto! The Willard（ウィラード, Japanese Punk band, one of Big 3 indie band with Uchoten, Laughin Nose when indie music was very big movement in Japan around 1985. formed in 1982 and they still do gigs and make records. So last year was their 30th anniversary. It might be easier for you to imagine like same important music movement of Punk in UK and they seems like The Damned, one of big 3 Punk band.) – Well, this is too personal topic, but they are my favourite band so I have to mention them! I vote for Uji! Surely one of the best places to visit in Japan! « Next Hyper Japan announced!